A group of blind people were in a room with an elephant. They decided that they wanted to describe the elephant. Each felt a part of the elephant. One person felt the elephant's trunk and described it. A second person felt the elephant's left back foot and described it. A third person felt the elephant's front right foot and told about it. A fourth person had a hold of the elephant's tail and described it. They all thought that what they are describing is the whole elephant and disagreed with each other. This is a traditional parable that describes our dilemma today. Firstly many of us don't understand the shahadah - laa-ilaaha-illallah (see post below). Secondly even if we understand something it is only partial. Some focus on spirituality, some on philosophy, some on legislation, some on reform and some on chanting. No doubt that the shahadah is multi-faceted yet it has to be understood holistically and in balance to reap its effects. The Prophets and the Messengers are the prime examples of this balance. They are chosen by Allah to teach the shahadah to the people. Therefore true and the only way to understanding the shahadah is through them. The Qur'an is full of their stories for this reason. Taking any other teaching or example is bound to give us a partial or incorrect understanding whether they be from philosophers, saints, story tellers, shaykhs, reformers, rationalists or political activists. 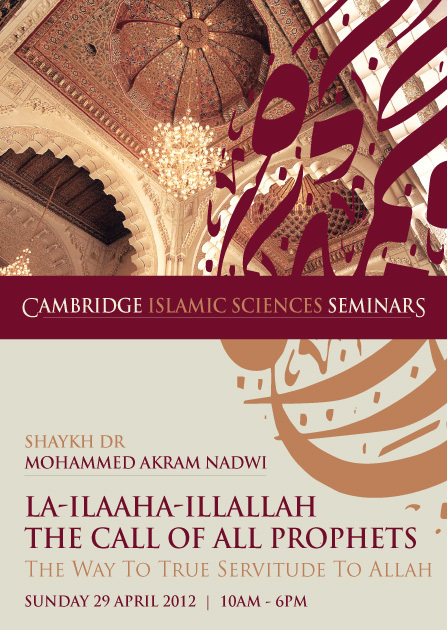 This is your opportunity to explore the multi dimensions of the shahadah through the teachings and examples of prophets in this life-changing one-day seminar on Sunday by Shaykh Dr Mohammed Akram Nadwi, one of the foremost Islamic scholars of Western Europe. We have a few more places left. Is Your Shahadah Valid in "Non-Muslim Lands"?